It was my nieces aqeeqah a week ago and my brother and sister-in-law invited the whole family to share the meat. They asked a restaurant to prepare the meat in a lamb curry and serve it with naan, roast chicken, salad and biryani. Every time I've had the meat from an aqeeqah sacrifice, it's tasted delicious and this time was no exception. 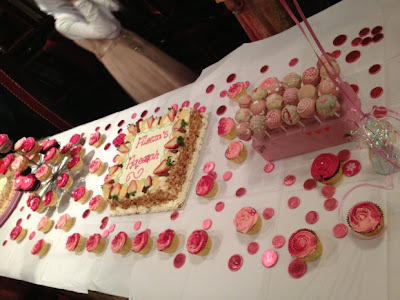 Fashionista Sister organised the dessert in the shape of a beautiful dessert table. There were three little ones keeping everyone loved up - the aqeeqah girl (Sweetheart), my daughter (Darling) and my little 9 month old cousin (Princess). I feel so blessed that these three came along in the last year and make so much dua that they grow up to benefit this ummah and please Allah insh'Allah. Darling in hand-crocheted headband which was a gift from a lovely friend. There were also matching booties, but the girl wouldn't keep her feet still long enough to take a picture (they all came out blurry). Sleeping beauty was off with the fairies for most of her aqeeqah. Alhamdulillah it was a lovely evening. I love having the whole family together and we had good fun breaking bread together and catching up with everyone's news. The babies wore pretty party dresses, my mum pulled out her latest lovely new outfit and I got the chance to add some bling to my abaya. Meanwhile my rowdy boys got the chance to hog the dessert table and try and sneak fizzy drinks. You can see more pictures on Kooky Little Sisters blog here and Fashionista Sisters blog here. ameen to your beautiful dua. Wow *nom *nom that dessert table is looking D'lish. Aqeeqah looked fab loving the decorations :D such a nice thought to celebrate the birth of a ickle bubba.